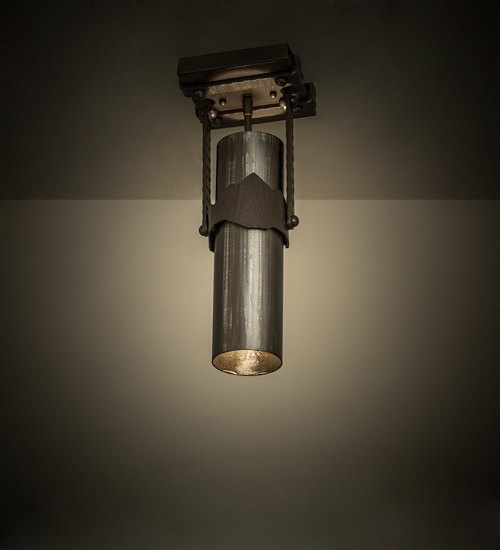 Description: The Iron Mountain ceiling fixture features a stylized mountain silhouette in a Sofia Sepia finish that wraps around an Industrial Steel cylindrical shaped diffuser. The diffuser interior reveals a complementary finish to match the rope-like suspension struts, hardware, and decorative accents. The flushmount is handcrafted by highly skilled artisans in our 180,000 square foot manufacturing facility in Yorkville, NY at the foothills of the Adirondack Mountains. Custom colors, sizes, and styles are available. Energy efficient options are offered. UL and cUL listed for dry and damp locations.